This is a great time for people interested in starting a cleaning business with little money. Cleaning is a stable and steadfast industry for entrepreneurs. There is very little serious risk, and companies that provide excellent service will always do well. The need for cleaning stays the same, yet, the business itself is always changing and growing. Professional cleaning is an excellent first endeavor in which to learn how to start and run a business. New cleaning jobs and opportunities become available every day. Technological advancements affect all levels of the industry, from advertising to sanitization. In fact, you might think anyone could make it in the cleaning business. How hard could it be, right? But the truth is, not everyone succeeds. Many dream of being their own boss but they lack knowledge or skills that would help them make it as an entrepreneur. Start a cleaning service while keeping your expenses low. 3. Admit it—you’re different. That’s good. Most people work for someone else. They are content being told what to do and when. People such as this gain security by listening to someone else with an idea. Their boss is calling the shots because they don't know how to set up their own system for work. Most people would have trouble setting a daily work schedule. Setting goals and then achieving them is hard for them. But not for you. You’re different. There is nothing wrong, and everything right, about being this way. The blood of an entrepreneur flows through your body. You define success differently than other people. You feel limited when somebody else controls your strings. You want to set your schedule. Why? Because you cherish independence. You aim for the moon. You want to place your financial goals in your hands, not someone else’s. So the first point to starting a cleaning business with little money is to recognize that you are different than others. You aren’t the average person. You dream of achieving something higher. Your security comes from within. From being your own boss. No, don’t ask them to help you clean, ask them to help grow your business. Happy, satisfied clients who talk about how happy and satisfied they are will help your cleaning business grow. And this advertisement costs you nothing. Talk about a win-win. All you have to do is do your job well. Do it with excellence and care, and you will win over your customers. I’ll let you in on a little secret. Your customers want to see your cleaning service succeed, and they want to help. Once you’ve proved yourself to them, they will be more than happy to refer you to their network or their circle, because they’re proud. Not so much of you, but proud of themselves for having had the good sense to hire you. 85% of start-up cleaning services do not ask for referrals. Perhaps they don’t believe their service is worth growing. If you are part of the 15% who believe in your service, try asking for referrals. “Ask and you shall receive.” New customers equal a steady increase in your cleaning business income. Maybe you’ve already dreamed up a business name and started telling everyone you know. Cleaning doesn’t take genius. You don’t need a ton of special skills to make a good living. So why not just DIY? Unless you want your cleaning business to fly right from the start. To start a cleaning business with little money, you need to know some tricks. Flying right from the start takes guidance. Even baby birds equipped with wings do better with instruction before mama shoves them off the edge. Nobody offered a helping hand or website when Ev and I first discovered our path of self-employment. Hardy as we were, we kept going even though we bungled a bunch of stuff at first. Cleaning fit our lives and paid well, so we persisted. Over the years, we’ve straightened out the kinks and improved our business systems. If you like to do things yourself, that’s wonderful. But if launching your cleaning business with little money is your goal, get guidance. Do the above 3 points speak to you? We love seeing people succeed in their own cleaning business. It makes us happy. I hope these suggestions help you take the next steps to being your own boss and finding your own path to self-employment. Being in charge of your own income and your own schedule is a big accomplishment. Not many people can pull it off. You may be excited about making it happen, but building a business with little money requires more than just wishful thinking. First, recognize that you’re different from most people. If self-employment calls to you, chances are good you have what it takes to be your own boss. Second, grow your business with help from people who know best—your customers. Third, and most critical for early success, get quality, professional guidance. The time and money you save up front will be priceless. 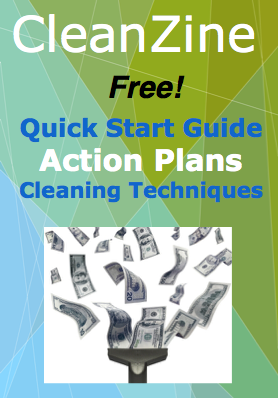 This is crucial if you want to start a cleaning business with little money. Early success in your business is fun. It generates positive feelings for you and your clients. Helpful people who offer early support can make all the difference for your success over the long haul. Those who succeed find a path that works for them. These three points will set you on that path. If you think you possess the right qualities, you may have what it takes to start a successful cleaning business without spending much upfront.